A vintage copper saucepan, circa 1970, that I recently bought on eBay. It was originally sold by Williams Sonoma and is stamped “Made in France.” It probably was made by Mauviel. I believe the French would call it a “sauteuse evasée,” or flared sauté pan. Last month, I wrote about buying a Lodge cast-iron wok. I have diligently seasoned the wok, and after a month of use I find that it’s hard to make things stick. For example, the wok browns tofu perfectly. The tofu remains slippery and stick-free from the moment it hits the oil until I slide the tofu out of the wok a few minutes later. I am ashamed of having forgotten — if in fact I ever knew — that our grandparents had nonstick cookware. It was called cast iron. The trick with cast iron is the seasoning. That is a scientific process. A blogger has described this process — and the science of it — here. In a nutshell, a thin layer of oil applied to the cast iron and then heated above the oil’s smoke point will turn the oil into a polymer. Not all oils work equally well. Flaxseed oil is said to be best because it is a “drying oil.” Once I understood that flaxseed is a drying oil, I realized that I was working with the same old-fashioned principle that I applied to the abbey’s floors and woodwork. I rubbed a thin layer of boiled linseed oil on the wood, then I let it dry. Boiled linseed oil is a drying oil. Then I applied more oil, and more again. The wood absorbs the oil, and the oil dries to a hard polymer finish. Over time, the color of the wood darkens into a beautiful, organic, natural-looking finish that (at least in my opinion) cannot be matched by modern finishes. It’s a floor finish that loves paste wax. But back to the wok. Six times, the wok went into a 550-degree oven with a thin coating of flaxseed oil. Thereafter, if you take care of the wok properly, the seasoning will continue to get better. Though clear glass cookware is new (thanks to Corning), ceramics, a close cousin of glass, have been used for cooking for thousands of years. Glass is inert. Corning Visions glassware conducts heat better than you might think. You also can see through it. As for copper, its use for cookware also goes back for thousands of years, much longer than iron. Copper conducts heat far better than any other affordable metal (silver is slightly better). No cooking surface is perfect. Among the considerations are: How well does it conduct heat? Do foods stick? Is it toxic? Is it easy to break? Since no cooking surface is perfect, it’s up to us to choose what works best for us, or for whatever we’re cooking. During the past fifty to seventy-five years, choosing cookware has been particularly confusing because there were new options such as Teflon, aluminum, and sandwiches of layered metals. I had been intrigued with the idea of induction ranges. They heat quickly, and it’s said that they adjust up and down as fast as gas. To test induction cooking, I bought an 1800-watt induction hot plate. I have not been impressed. I haven’t found it to be significantly faster than or more adjustable than my modest glasstop range. I will not be trading in my glasstop range for an induction range. There are two reasons, really: I don’t think that induction is that much better; and I’d have to give up using glass and copper cookware including a copper kettle. The quickness of an induction range can easily be canceled out by the poor conductivity of a stainless steel pot. Cast iron cookware seems to be making a comeback. In the U.S., Lodge now makes most of it. Vintage cast iron cookware now fetches handsome prices on eBay. Griswold cast iron cookware, which has not been made since the 1950s, is said to be the best. Griswold’s superiority, according to collectors, is that it was machine-polished after it was cast, so that the surface is smoother. Lodge, on the other hand, is not polished, probably because polishing it would double the cost. I’ve looked at a lot of Griswold cookware on eBay, but I have not bought any. That’s because the pitting and scraping of age and use seems to make the cooking surface much rougher than new Lodge ironware. And the surface of Lodge cookware gets smoother with proper use. As for copper cookware, here’s a nerdy article on its benefits and history. 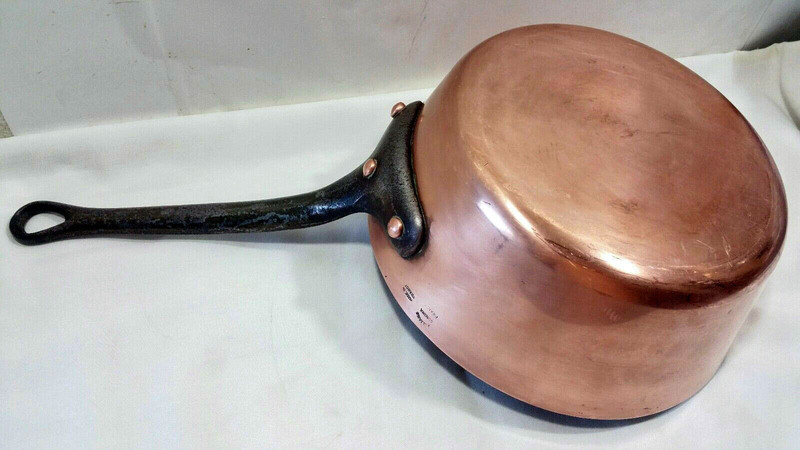 The thing about copper cookware is that it must be lined, because too much copper can be toxic. Tin, which is inert, has been traditionally used for lining copper pots. These days, stainless steel is often used. For a number of reasons, I prefer tin, though the tin lining must be treated with respect. Copper pots are very valuable and hold their value. They can be re-tinned. Here’s a link to a company that does re-tinning. Good copper pots are heirloom items. A good cooking pot becomes a kind of pet. And a really good cooking pot becomes an heirloom. This was written by daltoni. Posted on Tuesday, March 26, 2019, at 12:45 pm. Filed under Food. Bookmark the permalink. Follow comments here with the RSS feed. Trackbacks are closed, but you can post a comment. In my childhood we always made the morning porridge(oatmeal)in the cast iron cooking pot.